The FIG released the nominative list of athletes submitted by each nation to attend the World Championships in Nanning this October. While mostly an accurate glance at those set to attend, not all teams have been officially named and won’t be until the culmination of national team selection camps. All teams marked with an asterisk have not yet held their final selection camps and will not be decided until the next week or two. September 10, 2014 in 2014 World Championships, Argentina, Australia, Azerbaijan, Belarus, Belgium, Brazil, Bulgaria, Canada, Chile, China, Chinese Taipei, Colombia, Czech Republic, Denmark, Dominican Republic, Egypt, Finland, France, Georgia, Germany, Great Britain, Guatemala, Hong Kong, Hungary, Iceland, India, Ireland, Italy, Japan, Kazakhstan, Latvia, Lithuania, Malaysia, Mexico, Netherlands, New Zealand, North Korea, Norway, Panama, Peru, Poland, Portugal, Qatar, Romania, Russia, Serbia, Singapore, Slovakia, South Africa, South Korea, Spain, Sweden, Switzerland, Turkey, Ukraine, United States, Uzbekistan, Venezuela, Vietnam. Super interesting. I’m curious to see how the USA list stands after Camp. I think Maddie Desch is great for meets like PanAms and Jesolo but I can’t imagine her even being an alternate to Worlds. Isn’t the issue what they need the alternate to be capable of, though? Assuming the first 6 would be the main team, you have Desch, Dowell, Hano, Hundley, Hults, and Toronjo as alternate options. I can’t see them taking Macy or Nica (especially as they’d need to take another NT spot), Hano is unlikely as well (if they hadn’t needed her for Pan Ams, she wouldn’t have the NT spot). That leaves Desch, Dowell, and Hundley. Brenna’s said she plans to do AA at camp, but until camp happens, her status is unknown. If she’s good to compete, then I can see her as an option. If she’s not to where Martha wants, then you’re left with Desch and Hundley. Hundley beat Desch by a point at P&Gs, but her Pan Ams were not as good. Honestly, It’s not like they have a ton of choices for the alternate spot. I could see a lot of it hinging on Brenna’s showing at camp. Do you know what this means for Germany – does the fact that Eli Seitz is listed above Leah Griesser mean Eli is on the team and Leah is the alternate? They are still deciding between Eli and Leah! No announcement has been made yet, although they were definitely leaning toward Eli from what I’ve heard. What happened to Silvia Zarzu? I missed her name before! Poland hasn’t chosen there team yet. They have a meet next week and after that they will decide the worlds team. Gabby Jupp! So happy to see that name in contention again. Another favorite is Noemi Makra, she has so much potential! So its official no komova and afan? I’m happy yet sad. I want afan to rest for next year but I miss her sassy floor routines. Then I’m sad I will not be able to see komova! Mixed emotions over here! Lol. Afan is on the list! Ksenia Afanasyeva? Did I miss something major from Russia, is she actually considered for any spot? I thought it was Komova or Rodionova to be the alternate and both would have to improve on beam or develop a vault for the team. Afan was one of the ones included in that list of possible alternates Valentina talked about when she officially named the team after the Russian Cup. I think her routines are bare minimum, from what Valentina said, so no Amanar, no really difficult floor, etc, but if they really need her they might take her. 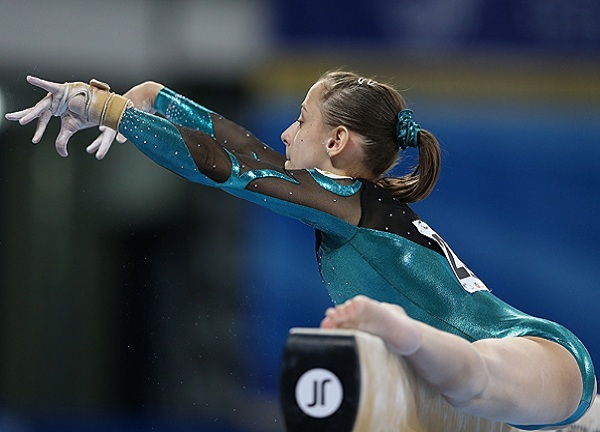 Follow up question: so is Darya Yelizarova Russian or Uzbekistani – is she not considered for this team? Yelizarova is no longer competing internationally at all. She left the Uzbek national team some time ago. She continues to compete in local and national meets in Russia. That’s all she wants to do now. Some of my contacts who are well connected to RGF have said that Valentina has been drinking because Afan hasn’t even been cleared to train regularly yet. Always remember to take information from Valentina with a grain of salt because she imagines a lot of things. Does anyone remember the incident with Oleg Verniaiev? That alone should continue to embarrass her. I’m not familiar with the Oleg Verniaiev incident. Details? what happen between Valentina and Oleg Verniaiev? Will Israel send any gymnasts? Right after the 2013 European Championships, Valentina made some statements about Oleg Verniaiev and Igor Radivilov saying that they were begging to join Nikolai Kuksenkov and train in Russia. Well, Verniaiev responded that he was amused to hear the story because he had never actually talked to her before. He’s talked to some of the Russian coaches casually at competitions, but there wasn’t an ounce of truth that he was asking to come to Russia. Meh, I did. The comments are arranged differently when you click on the reader. That’s where I replied from. I should’ve clicked on the actual page, oops! It’s crazy how 2 years ago, Larisa was the baby on the Romanian team and now she’s the leader. I’m curious to see how she’ll cope this year. I really want her to win that balance beam gold medal. And I can’t wait to see Pavlova, too. Wow! A great deal of diversity! this worlds is gonna be great!